Capture valuable input from customers and prospects using surveys that integrate results instantly in your GoldMine CRM system. Smart Survey provides a comprehensive survey solution that can be used for one on one or large audience surveying. You can also trigger ad hoc surveys based upon action and/or sales results tracked in GoldMine. Results are instantly added to a special survey tab as your recipients complete the survey. Seamless integration means no upload or download of data is required. Your annual subscription entitles you to unlimited surveys to any segment of your database, with no limits on the number of questions or respondents tracked. Powered by the IntelliClick web service installed on your network server, Smart Survey adds results to your GoldMine system in real time, as responses are posted by your survey participants. Use GoldMine automated processes to monitor survey results and trigger actions as issues or opportunities are identified. Results can be easily reviewed through reports and dashboards accessed directly within GoldMine. Click here to learn more by viewing our webinar recording. Use the Quick Response survey option to prepare custom, "one click" survey. This offers an alternative to more complex extended surveys and allows either numeric or text ratings. Generate a complete email template with survey options in a matter of minutes. 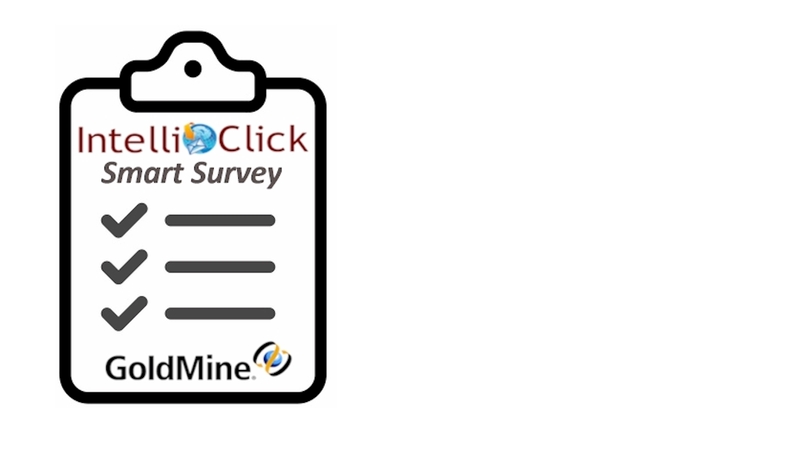 Use these surveys directly within GoldMine to send to any individual contact or target audience. Click here to learn more by viewing our webinar recording for this module. Your survey can set workflow automation the moment the survey is completed. This allows other conditions to be monitored and follow-up actions taken. Designated recipients can be notified instantly by e-mail or text message at the time a survey response is completed. Trigger emails with a link to your survey to go out individually based upon conditions within your GoldMine system. An example could be a client satisfaction survey based upon the completion of an appointment or other actions taken. Target a segment of your database to quickly reach out and obtain their input using an email campaign.